Desertification, the biggest threat to our food supply. ◆April can be taxing. If you get a refund – yay! Celebrate with a burger. If you had to pay, let us give youa break. It’s Joe’s 7thAnnual Burger Week starting April 8ththru the 15th. Any 2-topping Beef Burger is yours for just 8.99 (regularly 12.00). This is not just any beef. It is from Berry Ranch up in Raton. 6thgeneration ranchers doing it the way it needs to be done for our health, for the health of the land and for the ethical treatment of the cattle. Grass-fed and finished, no hormones, no antibiotics and no skittles! Yup CAFO cattle are fed skittles or whatever “calories” there may be cheap surplus of. Way too much info. Just enjoy your wonderful, healthy burger at a price you won’t see again ‘til next tax time. u Breakfast with the Angels– Thursday April 25thbring in a bunch of friends and have breakfast at Joe’s where 25% of every buck you spend goes to Kitchen Angels. Eat a lot, eat healthy and support the Angels as well. ◆Richard broadcasts theRichard Eeds Show live from Joe’s each 1stFriday of the monthfrom 1-4 pm on Hutton 1260 AM KTRC. Richard knows everyone in New Mexico – no joke! He keeps us abreast of all the New Mexico happenings. ◆ Desertification. Losing our soil, losing our food. Current agricultural practices encourage the degradationof soil, causing desertification (when fertile land dries up and turns to desert). The Savory Institute documentary “Running Out of Time,”features ecologist and international consultant Allan Savory, who discusses how grazing livestock is the solution to our ever-growing climate change problem. (Savory is the Joel Salatin of Africa.) Desertification happens when we create too much bare ground. 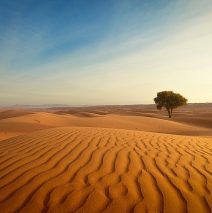 According to Savory, “a staggering two-thirds of the landmass on earth is already desertifying. This can be reversed only by dramatically increasing the number of grazing livestock.” Recall the vast herds of American buffalo, antelope, elk and deer roaming through belly-high grasses and kept moving by wolves and other predators in nature’s balancing dance. The documentary shows and explains how Savory’s system works in the real world, on his own farm and elsewhere — and how the African wildlife is integrated with the livestock and how local communities that have adopted the program have massively improved their living conditions. Look up Alan Savory Ted Talk and his U-tube videos. uEaster and Passoverare always intertwined. Joe’s will offer Easter dinner on Sunday April 21. Passover begins sundown of April 19thand ends on the 27th. Please join us on the 21stwhen Roland will offer succulent roast leg of lamb along with other delish dishes. Reservations highly recommended. u Another controversial health issue. As you may know by now, on the subject of conventionally-accepted health practices, I typically take “the road less travelled.” You probably know where I (and Roland of course) stand on controversial food & health issues like saturated fat, salt, chocolate, wine, coffee, sunshine, artificial sweeteners, exercise, diet. It now appears to me, there is yet another popularly-advocatedhealth practice that has proven itself to be flawed, sometimes fatallyflawed – avoiding sun. Don’t you wonder at the precipitous rise in numbers with diabetes, cardio vascular disease, autism, ADD, obesity, Alzheimer’s and many other diseases? I’m sure it distresses you too. Today I’m examining just one commonly accepted health practice – avoidance of sun and consequent Vit D3 deficiency. Increasing evidence now bears out the importance of this dangerously neglected “vitamin”. Vit D is not really a vitamin. D3 is actually a hormone (technically a seco-hormone). The body has receptor sites for various hormones and seco hormones like cannabinoids (yup, like CBD from Hemp and THC from Marijuana) and thyroid receptors and now we are learning there are D3 receptors in every cell of the body! What might we deduce from that? So many receptor sites indicate that the body requires, actually requires, a good supply of that agent – in this case D3 – both for specific functions and for overall optimal health. At least that is mydeduction. Let’s go further into why we need D3, how we became deficient and what defines deficiency? OK first, here’s some good news. The minimum daily requirement of D3was upped in 2010 from 400 IU to up to 2000 IU. In the opinion of some, still not high enough. But at least better than 400, which takes us just barely beyond susceptibility for Rickets (soft, mal-formed bones)! A blood test will measure your D levels. Ask your Doc for the test each year. Now be prepared – what the lab may consider normal may not be what you or I consider adequate. Any result below 20 ng/ml, any medical professional would agree, puts one at horrendous risk. And as far as D toxicity? – foooey. To get anywhere near that (which might feel like achy joints or achy kidneys) would take over 125,000 IU a day for quite some time. Now, we ARE individuals, so one person’s daily dose of 25,000 IU/day may not be right for you. Larger and/or heavier individuals may need much higher dosages. Factors that affect absorption of D3 are: age, gender, weight (specifically muscle to fat ratio), amount of natural sun exposure, skin color (the darker the skin, the more you need), latitude of residence. What I consider normal is in the range of 75 – 100 ng/ml. That’s MY OPINION ONLY, based on hours and hours and hours of research and observing my and others’ health. If you are old enough (yes there are benefits to accumulating decades), you may remember hardly anyone you knew before, say 1980, was fat. There was always one or two in your class considered overweight, but by today’s standards they would be considered just a bit “chubby”. As well, serious diseases were much more rare – cancer, diabetes, CV disease, depression, arthritis, allergies or ADHD. Nowadays hardly any single person is free of all of these conditions, no matter their age. I do believe all of these conditions are linked to D deficiency. And BTW, being free of all these conditions is actually normal and possible. OK, so what happened that we tumbled into D3 deficiency? Well, starting in the 80’s we were cautioned to avoid sun exposure and furthermore to slather ourselves with sun block. I’m not saying that D3 deficiency is the one and only cause of all of these conditions. Hmmm…maybe I am. Nevertheless, what’s important is the consequenceof the deficiency. D3, being a hormone and having receptors in ALL the cells of your body, has a global effect on your functioning. Your skin, when exposed to sunlight, activates D. When deprived of sunlight (or sufficient supplementation) we deprive ourselves of this vital hormone. For the moment, just assume that everyone needs a good amount of D3 (or sunshine! – your choice). What happens then when we don’t get sufficient? Well, populations with these conditions have been found to be overwhelmingly deficient in D: obesity, depression, arthritis (especially rheumatoid), allergies, musculoskeletal pain, recurring colds, flu, osteomalacia, osteoporosis, neurological disorders like Alzheimer’s and dementia and others. The point being, D3 has such a broad and profound effect on our health and ability to function, it would be hard to overstate it and very hard to overdose on it. thinner, K2 is NOT. (3.) Be very cautious with calcium supplementation – it has caused great harm because of our reduced sun exposure. A great, informative book is “Vitamin K2 and the Calcium Paradox”by Dr. Kate Rheaume-Bleue. (4.) As we age (don’t you just hate that phrase?) the ability of our skin to make D3 is diminished. So, oral D3 supplementation becomes unavoidable no matter how much sun we get. Although it’s almost impossible to reach adequate D levels with food alone, here are some good D3 sources to include in your diet: Pasture-raised eggs, mushrooms raised with some sun exposure, cod, salmon, shrimp and tuna. Some good books on Vit D: Dr. Holick’s The Vitamin D Solution, andThe Miraculous Results of Extremely High Doses of Vit D3by J. Bowles. A kid decides to earn some money doing odd jobs. He went to the first house in an upscale area and asked the owner if he had any jobs for him. “Well, you can paint my porch. How much will you charge?” The kid said, “How about 50 dollars?” The man agreed and said the paint and ladders were in the garage. The man’s wife, hearing the conversation asked her husband, “Does he realize the porch goes all the way around the house?” The man replied, “He should. He was standing on the porch.” A short time later, the kid came to the door to collect his money. “You’re finished already?” the man asked. “Yes, and I had paint left over.” Impressed, the man reached in his pocket for the $50. “And by the way,” the kid added, “that’s not a porch, it’s a Ferrari.